Though my instrument of choice is the air guitar (really, I’m quite good with my imaginary instrument), I love music and thought I’d share some of my favorites here. Starting off with a Finnish band PMMP. What I adore about this band is that they have managed to grow up, have children of their own and keep their attitude and energy (they released their 6th album “Rakkaudesta” this June). During the years they have sung about tan lines (their first 2003 hit! ), domestic violence (as a part of an Amnesty campaign), loneliness, about being a little bit crazy and those nights when you stayed up too late dancing and ended up watching the sunrise by the sea. Here are some of my favorite PMMP songs, starting with Lautturi (The Ferryman). Last week when I went shopping for clothes for my 2-year-old nephew, I ended up not buying cute little T-shirts like I had imagined, but rather running away in fear of the dreaded pink and blue Monster that seems to have gotten a firm hold of especially children’s clothing stores. This particular store, literally split in half to girls and boys sections, into the pinks and blues, felt to me like a nightmarish world for stereotypical passive, pink, cute girls and the active, brave, adventurous boys. Fast forward a couple of days, I entered a store owned by the same company that owns Victoria’s Secret, PINK, which by its very name makes me wonder about our obsession with color and why pink seems to have such a special role in the upbringing and adulthood of 21st century women. Are we as a culture obsessed by color and its meaning in general? The practice of separating children’s gender by color originates from French orphanages where children were marked with pink and blue, according to their gender. Pink for girls, and blue for boys. Historically however, red has been a color of power and high birth, majesty, danger, and strength – all qualities that have been considered masculine. Just picture the traditional image we have of a king, usually depicted in a fur-lined red cape. Often high-ranking uniforms are still red: Roman Catholic cardinals wear red, as do the Canadian Mounted Police and the British Army. According to an 1918 article in Earnshaw’s Infants’ Department: “The generally accepted rule is pink for the boys, and blue for the girls. The reason is that pink, being a more decided and stronger color, is more suitable for the boy, while blue, which is more delicate and dainty, is prettier for the girl.” Blue was also the color of Virgin Mary and hence better suited for girls. The different shades of pink; the baby pinks and the fuchsias, are colors that imply youth, virginity and beauty. Pink lips, fair skin, our ideals of traditional beauty and roses and romantic love. In the course of human history, we have certainly seen both sides of the coin (or in this case, the color wheel) and to be clear, my issue is not really with any single color: It is with the obsession we have on these colors in today’s society and shopping culture. Perhaps we could try to change our attitudes toward color and forget the color divisions, especially in how we decorate children’s shops. It is would foolish to claim that these extreme divisions in color don’t have any effect on a more profound level in how we treat boys and girls. When it comes to those stores that are painted floor to ceiling pink and targeted for women in my age group, I do feel like I must have missed something about being a woman. And as a girl who loved wearing blue dresses and played with both cars and dolls, I do like pink. Really. I created this journal over two years ago and never posted a thing. Lack of inspiration perhaps, or to be honest, I never really knew what to write about. What to focus on. Until today, when I woke up and felt an urge to write about dinosaurs. That’s right, velociraptors to be precise. Starting off with a roar, eh? Clever girl…. In 1993, when I was ten, I first saw Jurassic Park in the cinema and I loved it. I was terrified, but loved the dinosaurs in non-cuddly, going-to-piss-myself-kind of way. The scene where the T-Rex bows down behind the car window is something I still frequently reenact in my dreams. Often when I sleep in a house where my window is on the first floor, I have a recurring dream of a tyrannosaurus crouching behind my closed window while I sleep, breathing its terrifying, smelly carnivore’s breath on the glass. (Luckily my dream world has been always faithful to the first Jurassic Park film in which the T-rex can only sense movement. I try to lie totally still, not moving a muscle. So far I have survived all my dinosaur nights without being torn to pieces). The fear Jurassic Park awoke in me as a child was definitely the opening notes of the symphony of terror I later came to experience with Alien – a film a learned to love later in life, once I was finally able to watch the film without hiding under a blanket. I was no longer only afraid of monsters, I learned to appreciate them. 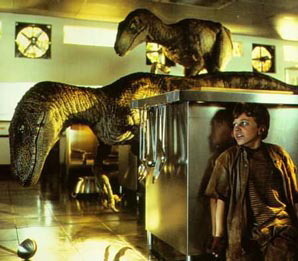 The most terrifying creatures in Jurassic Park were the velociraptors. They were all female, all very clever and deadly. Unlike their more animalistic counterparts (such as the T-Rex who would react only to movement), the raptors were portrayed as highly intelligent and, though larger than human, small enough to chase after our heroes in small closed spaces and corridors. They could open doors, jump high, and work together in groups making them lethal, perfect predators. Raptors Holmes and Watson working together in the JP kitchens. Who dropped the ladle? After the first Jurassic Park film, the cinematic fate of the raptors was much like the Alien’s Xenomorphs’ Alien 3 onwards. In the following sequels there were more monsters, that were faster and shinier than in the original. And as we all know, more doesn’t usually mean better. We don’t want our monsters, or our characters, to be totally expendable and lacking personality! In the second Jurassic Park film, the feared velociraptor had turned from an apex predator into a goofball (a goofball that can be beat with high school gymnastics – if you have seen the film I’m sure you know what I mean). This morning, when I awoke from a dream where I was being chased by my sharp-toothed friends, I could not but wonder what are the new creatures that frighten our socks off and leave us afraid of the dark? Are there new creatures that level with the good old Jaws, the xenomorphs, or my friends the raptors? The past decade has had the most advanced technologies at its use but yet the monsters are often, well, not that scary. There might be hundreds of monsters in a single CGI shot but they are not memorable. One does rise up from the masses though: Guillermo del Toro’s magnificent Pale Man from Pan’s Labyrinth (El laberinto del fauno, 2006), portrayed by Doug Jones (who also plays the Faun in the film). Had I seen Pan’s Labyrinth anytime before my 20’th birthday, I’m pretty sure would have never been able to eat grapes again… The Pale Man is the kind of monster you will not forget after seeing him in action. 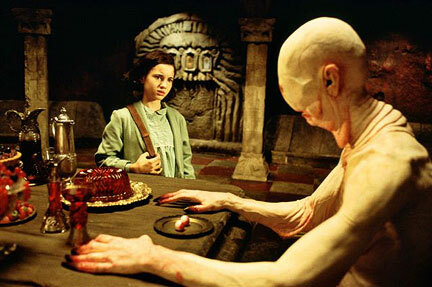 And what is that on the table in front of the Pale Man… that yummy looking dessert? Could that be, umm…jello?